This attractive turn-of-the-century Bradbury (F. G. Smith, New York) 5'4" Mahogany baby grand was acquired by a Washington DC area family with children in music lessons, knowing it would need significant restoration to be playable. 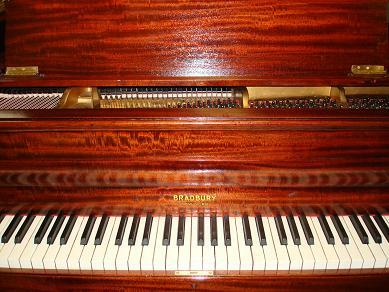 When new, this Bradbury was a high-quality small grand, with many technical features clearly emulating Steinway inventions patented about 20 years earlier, including duplex and triplex scaling, "Capo D'Astro" bar framing, and the sostenuto "middle" pedal attachment. The stringing scale lengths in the treble are also identical to those used on small Steinway grands. The brass-bound turned and carved legs and slightly decorative case design are typical of the turn-of-the-century period for American pianos. No serial number was found on the instrument during restoration, and the original serial number on the stringplate was apparently obliterated by previous repaintings. One previous owner of this instrument was the Swedish Embassy in Washington DC, who had information suggesting it was built in 1898. This instrument was completely restored by Historic Pianos in 2009. Initial evaluation showed that the pinblock was severely cracked with separated laminations, with the lower two or three laminations entirely missing, so the instrument could not be tuned because of low holding torque. The action was stiff and uneven, with an overall very heavy touchweight. Down weight ranged from extremely light 25 g to very heavy 90 g, and averaged a heavy nearly 60 g, where 45-50g is normal. The touch problems appeared to be a combination of installation of heavy replacement hammers some years ago, with improper key weighting. The key levers themselves were too heavy, with some weighing well in excess of 200g, when 100-150g is generally normal, with as many as 9-10 key weights (normal is 1-4) installed both before and behind the balance rail, apparently by previous technicians attempting to correct other action regulation errors. The action and wippens were in need of major repair, with several loose glue joints in each whippen. The hammers were quality new Ronsen hammers from many years ago, showing almost no wear because the instrument was otherwise unplayable. The soundboard had several significant cracks with separation from ribs, with significant loss of crown in the middle of the board. Someone had also attempted to refinish the stringplate in place with gold spray paint, so that that tuning pins, strings, agraffes, and some of the soundboard, case, action parts and bridges were fouled with paint residue. The mahogany had been poorly refinished with loss of color, clarity and gloss. And the instrument was balanced precariously on legs missing anchoring screws and lyre braces. Restoration included complete disassembly, laminated maple pinblock replacement, soundboard and bridge repair to restore integrity and crown, cleaning and regilding of the stringplate, cleaning and polishing all metal parts including agraffes, plate screws, pedals and hinges. It was restrung with custom bass strings and nickel-plated #2 tuning pins, achieving ideal tuning torque and excellent downbearing. Since the original wippens were unusual in dimension and could not be replaced with available new ones, they were rebuilt and repaired as needed, regluing weak joints, replacing silk action cords and wire springs, and replacing center bushings and pins. The action was regulated and rebalanced to ideal, uniform touchweight, and replacement simulated ivory keytops were installed. The hammers were voiced to provide an even, moderately bright tone. The red mahogany case was stripped and completely refinished with a shellac/oil French Polish finish.